It is a great honour for me to speak at this opening ceremony on behalf of the International Steering Committee in order to thank the Organising Committee for their hard and excellent work in making this international conference possible and to wish the participants an enjoyable, interesting and productive conference and workshop. I also bring greetings and messages of support from the Vice Chancellor of the University of Nottingham, UK that has a formal academic link with USM and also the International Peat Society of which I am a member of its Executive Management Board with special responsibility for tropical peatlands. This meeting is being held partly to celebrate the 30th Anniversary of the Establishment of the School of Biological Sciences at USM, partly as a focus for the activities of the International Peat Swamp Research Group and partly for presentations by others with an interest in tropical peatlands because this is a critical time for this ecosystem. The work of the International Peat Swamp Research Group commenced in Central Kalimantan, Indonesia in 1993 with collaborative field research carried out by the Universities of Nottingham and Leicester, UK, Palangka Raya, Indonesia and Hokkaido, Japan. It has now grown to include Universiti Sains Malaysia, Gadjah Mada and Sriwijaya Universities, Indonesia, the University of Helsinki, Finland and Kalteng Consultants, Germany. There are associate researchers in the University of Bern, Switzerland, Monash University, Australia and the Indonesian Agency for the Assessment and Implementation of Technology (BPPT). It should be obvious from this list that those involved are mostly universities and that the work we carry out is pure and applied research. The over-riding requisite is the acquisition of primary data to support realistic proposals for the environmentally sustainable management of tropical peatland resources. That is our strength. Primary data cannot be disputed only its interpretation. Our aim is to produce a comprehensive detailed data base and inventory of tropical peatland ecological functions, natural resources and socio-economic values in Southeast Asia in the shortest possible time and to utilise these for multiple wise use of this ecosystem. Conferences on Tropical Peat Relatively few international conferences have been devoted to tropical peat and peatland but all have been important benchmarks in their own way. 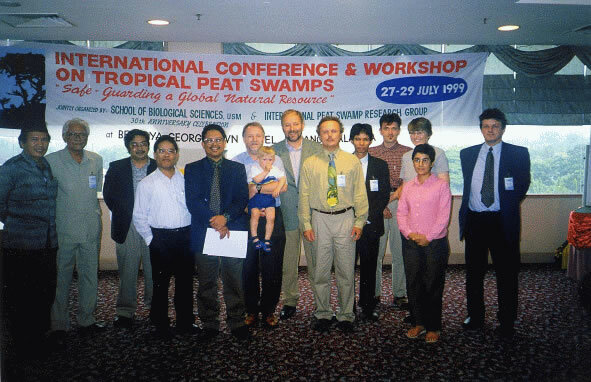 The first was organised by the International Peat Society in Yogyakarta, Indonesia in 1987 with the title "Tropical Peat and Peatlands for Development". The second was held in Kuching, Sarawak in 1991 sponsored by MARDI, the Malaysian Agriculture Research and Development Institute. Both of these events concentrated on the development potential of tropical peatlands and had little content on ecological function, wildlife importance or sustainable management. This imbalance was redressed in 1995 at the international held in Palangka Raya, Central Kalimantan in 1995 on "Biodiversity and Sustainability of Tropical Peat and Peatlands. Now in 1999 we are moving a step further to discuss how to "Safeguard a Global Natural Resource" with around 40 papers t6o be presented, most of which deal in some way or other with the environmental importance and sustainable management of tropical peatlands. I want you all to consider very carefully and seriously how and why the emphasis has changed from mostly development in 1987 to natural resource protection in 1997. This is a quantum leap of immense proportions and there are very good reasons for it most of which will be dealt with in the conference sessions. Importance Peatlands globally are sensitive and vulnerable ecosystems and tropical peatlands are especially so. Owing to the location of most tropical peatlands at or near sea level and the physical and chemical properties of tropical peat soils derived from them they present many serious problems for land use conversion and development. They are special types of wetland and perform many of the usual natural functions of wetlands but, in addition, they have special important attributes such as carbon fixation and storage and climate stabilisation properties. Unfortunately, until now, they have been accorded insufficient attention by Governments in the tropical zone and for that matter internationally who, at best, have under-rated their environmental importance and at worst have ridiculed the importance of their ecological and natural resource functions. The special characteristics of tropical peatlands are ignored to the peril of policy makers and land developers as has been shown forcefully by the environmental disaster resulting from the recent failure of the one million hectares Mega Rice Project in Central Kalimantan, Indonesia. Institutional stupidity and environmental damage on this scale must not be allowed to happen again although the current pressure for continued peatland development in Indonesia shows that lessons have not yet been learned. Responsibility The responsibility for bringing about change in the official attitude to tropical peatland lies with the Governments of those countries that have large areas of landscape covered with this ecosystem. These are principally Indonesia and Malaysia that between them have more than 70% of this global resource. They must accept their commitments under International Treatments for the Maintenance of Biodiversity, Protection of Rare and Endangered Species and the Conservation and Sustainable Management of Wetlands in order to protect and conserve large areas of pristine or undeveloped tropical peatlands. The best and largest areas that remain in Irian Jaya, Kalimantan, Sarawak and Sumatra are not protected and many are currently being developed or threatened with development. The result of land conversion from tropical peatland to other land use is not sustainable for either the tropical peatland ecosystem or the peat substrate in the medium to long term. The 7th Ramsar Convention COP Meeting held in San Jose, Costa Rica in May 1999 approved the preparation and implementation of a Global Peatland Action Plan with special emphasis on the conservation of tropical peatlands. This decision applies to all Ramsar Contracting Parties including Indonesia and Malaysia. These Governments should take a lead immediately to determine the extent and importance of their peatland resources and implement measures to gazette large areas of the best that remain as National Parks or Wildlife Conservation areas and prepare management plans for them and, in addition, embrace the concepts of multiple wise use for the environmentally sustainable management of the total peatland resources within their borders. Future The future for tropical peatlands does not look good. The momentum for land use change, involving forest clearance and drainage is increasing. Tropical peatlands continue to be regarded as second class ecosystems - the Cinderella Ecosystem - that are ignored and forgotten even though they are immensely important for their biodiversity, functions and socio-economic value. The true value of this ecosystem for people, regional landscapes and the global environment is uncosted and overlooked in the dash for short term gain even though this leads to unsustainable activities and loss of money in the medium to long term. It is now time to count the cost and to provide proper, independently evaluated, environmental assessments of this resource in order to determine the most appropriate land use (including environmental resource protection) so that the remaining vast tropical peatland landscapes can provide their true worth to present and future generations. Have a good conference with a reasoned and lively debate of the key issues and come up with some clear guidance for the truly environmental sustainable management of tropical peatland according to the principle of multiple wise use.